Zombies are taking over our world. With the rising popularity of AMC’s The Walking Dead, others are trying to jump on the bandwagon. Zombies are the new vampires. The problem with attempting to zombify everything is that the same thing cannot be done over and over again. Zombie movies have been around for ages and they’ve finally been popularized on a nation-wide level with The Walking Dead. Those trying to use zombies in their work need to be able to put a twist on them that we haven’t seen before. We’re already about to see a new zombie approach this weekend with World War Z. The jury is still out on whether or not fast zombies will work, but at least it isn’t something repetitive. After spending the weekend immersing myself in Playstation 3’s The Last of Us, I can definitively say that video game developer Naughty Dog has created a zombie-apocolyptic world that is similar to other ones that we have seen before, but is different enough to separates itself from the pack. The Last of Us features zombies that they call “the infected” or “clickers.” “The infected” are people who develop a disease that causes some sort of fungus to grow inside of the brain and cause the person to turn into a zombie. “Clickers” are zombies that have had the fungus take over their bodies and must use sound waves to detect their surroundings. It is a great little twist on something that we have seen many times before and works extremely well, especially within the gameplay. Throughout the game you’ll encounter clickers and infected and must decide how to approach dealing with them. You can either try to maneuver your way around/through them without being detected or you can try blasting through. Most of the time you’ll be trying to sneak by because of how limited you are on weapons throughout the game. At first it seemed like the lack of weapons would cause a problem with gameplay, but it’s something that isn’t really done very often in video games. Rather than creating a game that focuses on mostly shooting your way out of situations with infinite ammo, The Last of Us brings a realistic approach. During a zombie apocalypse you would need to conserve your ammo or medicine whenever you could because you would’t know when you’ll be able to find more. This is exactly what The Last of Us forces you to do and it makes you think differently than you would when playing most games. Despite the outstanding gameplay, the reason a person would play this game is because of the brilliant storytelling. 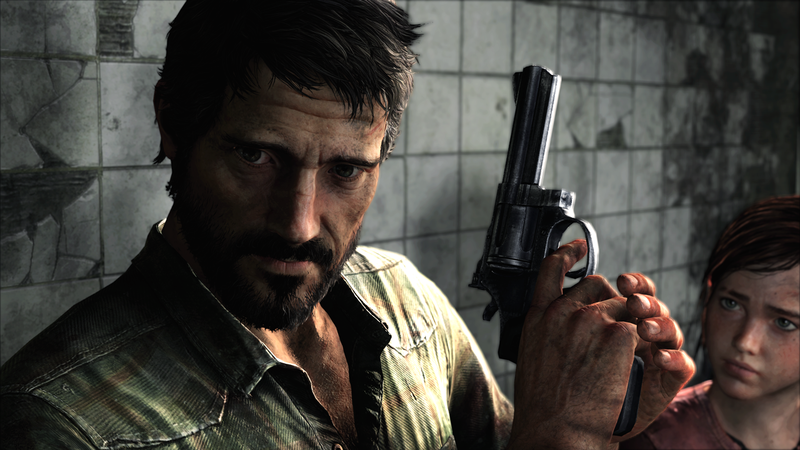 To think that you’d be looking for story substance in a video game might seem outrageous to some, but The Last of Us might as well be an extremely long movie that you actually get to participate in. The story of main characters Joel and Ellie is easily the best and most important part of this game. The background of The Last of Us may be set in a world where zombies have taken over, but the relationship between Joel and Ellie is the real story. Zombies come second to the connection between these two characters. This game is a character story disguised as a zombie story. I won’t give away the specifics because I’m trying to keep this review as spoiler free as possible and you really should experience this narrative on your own, but just know that you’re going to end up being absorbed in the complicated relationship Joel and Ellie develop. The only issue with this game was concern that it was getting a little bit stale. You pretty much do one of two things throughout. You either make your way through zombies, or you make your way through a group of other survivors. Luckily there is enough variation that it doesn’t become too much of a problem. Plus, you eventually get so invested in Joel and Ellie’s fate that it becomes a nonissue. Naughty Dog has outdone itself again by bringing us a game on the same level as it’s previous series. This new game will fit in well with their already stellar lineage of Crash Bandicoot, Jak and Uncharted. If you’re looking for, not just a new game, but a new experience, definitely go pick up The Last of Us. Reblogged this on My New PlayStation.